An exclusive adults-only sanctuary situated in Fiji's spectacular Beqa Lagoon, Royal Davui Island Resort is currently the only private island resort with private plunge pools for each and every Vale. An exclusive adults-only sanctuary situated in Fiji’s spectacular Beqa Lagoon, Royal Davui Island Resort is currently the only private island resort with private plunge pools for each and every Vale. 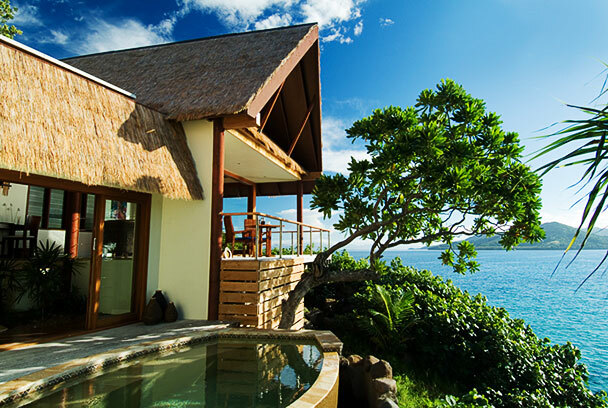 Only 16 exquisitely appointed Vales (traditional Fijian villas) nestle around 10 acres of lush tropical landscape allowing for no more than 32 guests on the island at any one time, ensuring the ultimate in privacy, personal service and relaxation. All vales are designed and built in a modern pacific manner with thached roofs, tropical décor, high ceilings and your very own private plunge pool. 3 Island Pool Vale – Stunning views of the lagoon with close access to the southern beach. Features a King size bed and private sun deck. 6 Deluxe Pool Vale - Located the Eastern and Southern sides of Royal Davui featuring a separate living room & bedroom, King size bed, air conditioning, and private sun deck. Premium Pool Vale – Sitting at irregular angles on the Western and Eastern sides of the island featuring a separate living room & bedroom, King bed with 20ft canopy, air conditioning, and private sun deck. Beqa Lagoon is renowned for some of Fiji's best diving and snorkeling locations, and has become famous across the globe for offering divers a wide variety of dive sites and marine life within the one Lagoon.. Everything from soft coral to shipwrecks are found within the protective lagoon reef system. For the more adventurous, there is Aqua-Trek’s Ultimate Shark Encounter, only 45-minutes from the resort by fast boat. Located in the center of Beqa Lagoon is Royal Davui Island Resort, so all dive sites are within 30 minutes of the resort with a number of them being accessible direct from the beach. A dive not for the fainthearted, but one well worth doing. Descend the Northern edge of the lagoon along with shark wranglers and feeders. Sit back and enjoy the show as large bull, tiger and reef sharks are hand feed. These series of pinnacles seem to have everything a diver could want. Caverns and overhangs covered in soft corals and fans, fish in every colour and an abundance of anemones. Arguably the best dive site in the Lagoon, however is also subject to strong currents. The stunning display of soft corals, anemones and fish life that covers this pinnacle truly lives up to the name of Fantasea. This series of coral bombies offer divers a beautiful dive with many forms of coral and fish with a massive archway lined with soft corals of every colour imaginable that you swim through. One of the most famous dive sites in the lagoon with dozens of bombies covered in so much life. This site warrants several dives in order to see just a small percentage of it offers. These three massive coral bombies seem to be perfectly aligned and are covered in soft and hard coral as well a wealth of colourful tropical fish. Deriving it’s name from the seven pinnacles in close proximity to each other, this site offers divers an amazing aquarium like experience. Hard & soft coral, and a large variety of tropical fish make this a spectacular dive. Sunk in 1994 as a dive site, this old 200 ton fishing vessel sit up-right on a sandy bottom in about 25m of water. The visibility of this site is usually great for underwater photography. This remote location offers some of the most spectacular coral formations with giant gorgonian fans and black coral bushes. This site is subject to some strong currents and is therefore only for advanced divers. Sunk in 2006, this 200ft fishing vessel sits in 20-30m of water and is accessible direct from the Resort. Ideal for new divers or those that want to see the amazing Davui Marine Park from a prospective other than snorkelling. Night dives allow guests to see the Marine Park in a whole new light (no pun intended) with an abundance of nocturnal marine creatures venturing out. Located on the Southern side of the Lagoon, this open water dive offers astounding visibility with some larger fish. Ask us about our current specials at Royal Davui!